According to the Directorate General of Migration (DGM), during the month of January 2019, following the investigations of the intelligence services associated with the complaints of the population, 6,461 Haitians were controlled in an irregular migratory situation on the Dominican territory and taken back to the border posts of Dajabón, Jimaní and Elías Piña to be registered and deported to Haiti. Also over the same period, 7,550 Haitians were turned back at the border as they tried to enter the Dominican territory illegally. 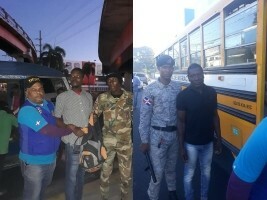 227 foreigners from China, Colombia, Cuba, Curaçao, Peru, Russia and Venezuela were also held illegal in Dominican territory and the deportation process was initiated in cooperation with their respective embassies.